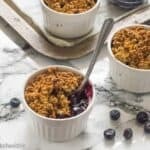 Gluten free blueberry crisp recipe – This delicious dessert is made from blueberries with a crunchy walnut and rolled oats streusel topping. The summer is the perfect time to make so many desserts especially if you have a sweet tooth. 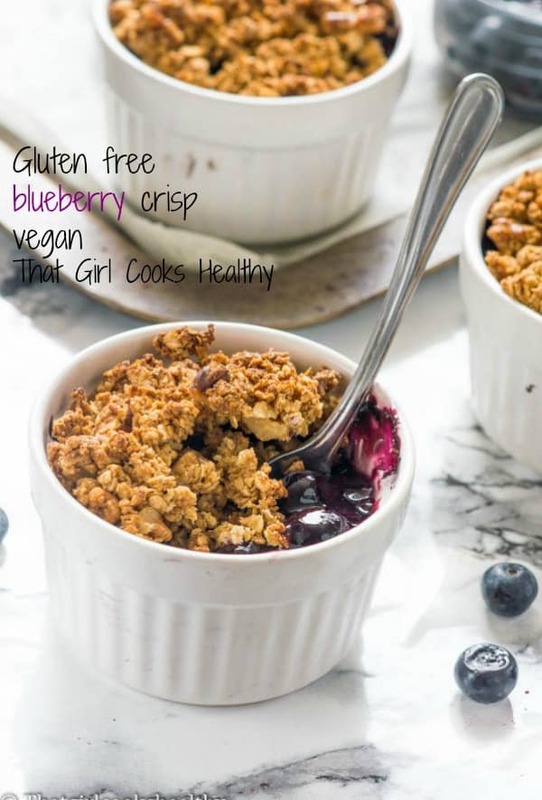 If you love blueberries then you will enjoy this summer time gluten free blueberry crisp. A subtle but sweet berry interior with a crumbly oat and nut topping – the best of both worlds!! In case you’re not familiar with what a crisp dessert is that’s okay because I will give a brief definition. Crisp is an American styled dessert consisting of fruit which serves as the foundation of the recipe. The fruit is then topped with a crumbly topping. This crumbly topping is made from oats, nuts, flour, butter , sugar and sometimes spices. The name derives from the crispy topping. Here in the UK crisp is referred to as a crumble. A great example of this is this apple crumble recipe that I created. As the recipe post states this is a gluten free blueberry crisp. There is no gluten in sight, if you’re familiar with gluten free cooking more specifically gluten free flour, then you will be already know with buckwheat flour is. Buckwheat flour derives from the rhubarb family. It’s quite an inexpensive gluten free flour and very easy to obtain from most health stores or on Amazon. Buckwheat is my go flour for pancakes and many desserts because it works so well on its own. There are sooooooo many recipes out there that use pans, dishes or trays to house their crisp dessert. 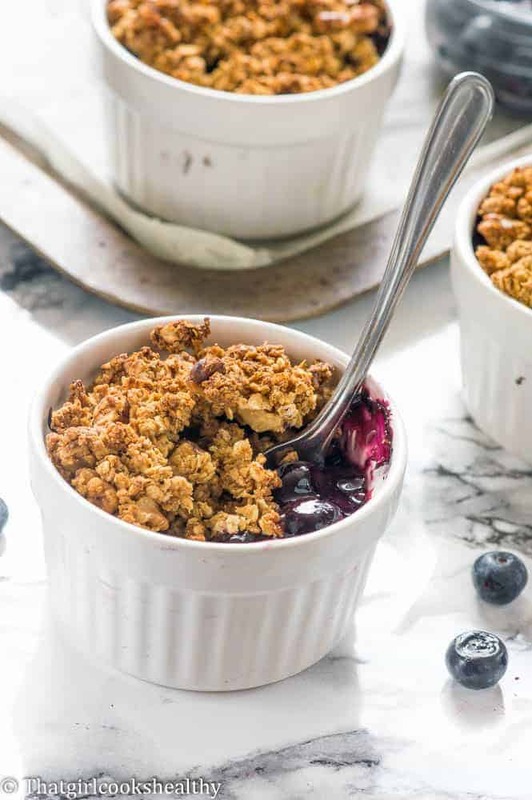 Ramekins are a really cool way of serving your blueberry crisp to individuals. You can serve a small number (or large if you double the recipe) to each guest. I think using ramekins makes the recipe seem more personal. Almost as if you made the recipe for a specific person. You don’t have to grease each ramekin as they naturally tend to be quite non stick. The filling for the dessert consists of fresh blueberries, lemon, coconut sugar for a low GI index option and some tapioca starch. A lot of recipes call for cornstarch but I like to add tapioca starch because I use this by default. Use which every starch you want but ultimately it will serve as your thickener. You can use frozen berries or fresh, either will yield the same results but I would advise allowing frozen berries to completely thaw out or run them under lukewarm water to ease thawing. They don’t take very long to thaw out completely but bleed ALOT so blot off the excess liquid before to moving onto the next step. If using fresh berries make sure the water isn’t blotted off in excess after washing them. You want some moisture so the filling isn’t dry once the topping is applied and baked. I made sure to remedy this by adding an extra tablespoon of water when the berries are tossed with the starch and sugar. The topping forms part of the magic for this berry dessert. I used chopped walnuts, actually I just used my fingers to break them into four small pieces per walnut. If walnuts aren’t your thing pecans are a great option. The crumble consists of the walnuts, oats – I used rolled oats but quick or jumbo oats are a viable option, coconut sugar , cinnamon and cold dairy free butter. Make sure the butter is cold and not melting at all. Another tip, I used a paring knife to carefully cut the butter stick into pea size pieces. It’s so much easier to work with butter in bitesize pieces and not so messy. Breakdown the butter and using the pads of your fingers to truly work the butter into the coconut sugar and flour. At the same time you are folding the bigger ingredients (oat and walnuts) into what should be a crumbly mixture. Squeeze a few pieces of the “crumble” there should be no signs of butter pieces. That’s when you know your crumble is ready. Some people aren’t overly keen on oats and that’s fine. There are other gluten free alternatives to hand. Another great choice is almond meal or brown rice flour. Use the same measurement (1 cup) and to a direct 1:1 ratio substitute. Use a colander to thoroughly wash the fresh blueberries. If using frozen simply allow them to thaw out completely in a colander. Shake the colander a few times to drain off the excess water from the berries (don’t blot). Transfer the blueberries into a medium sized bowl along with the coconut sugar, lemon, water and tapioca starch. 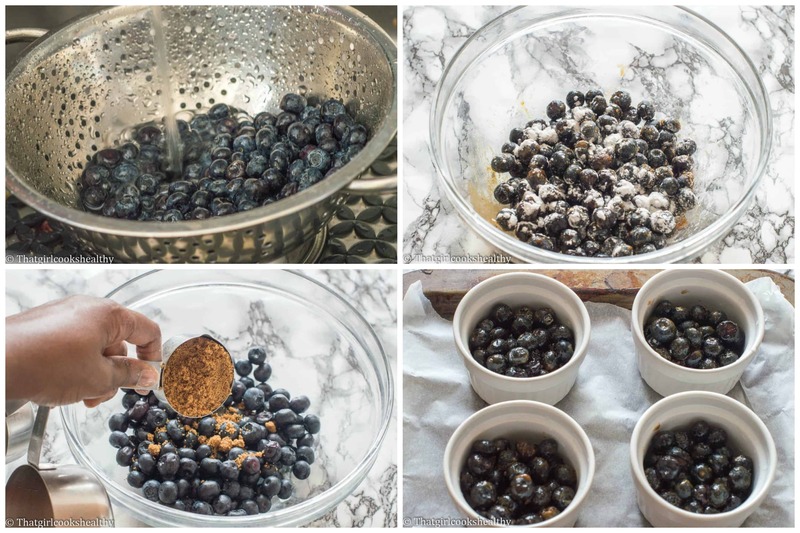 Use your hand or a spoon to fold and coat the blueberries with the mixture . There should be some liquid at bottom of the bowl which is fine and required. Place 4 ramekins on a baking tray and use a spoon to evenly distribute the filling into each pot and set aside. Meantime, prepare the topping, in another medium sized bowl, add the oats, buckwheat flour, coconut sugar and cinnamon. Scrape the dairy free butter into the bowl and use your fingers to breakdown the butter and rub into the floury mixture so everything congeals together making a crumble. Bake in the oven for 30 minutes until the topping is golden brown. The filling may bubble through and this is perfectly normal if it does. Maybe I’m weird but I actually collect ramekins, lol. 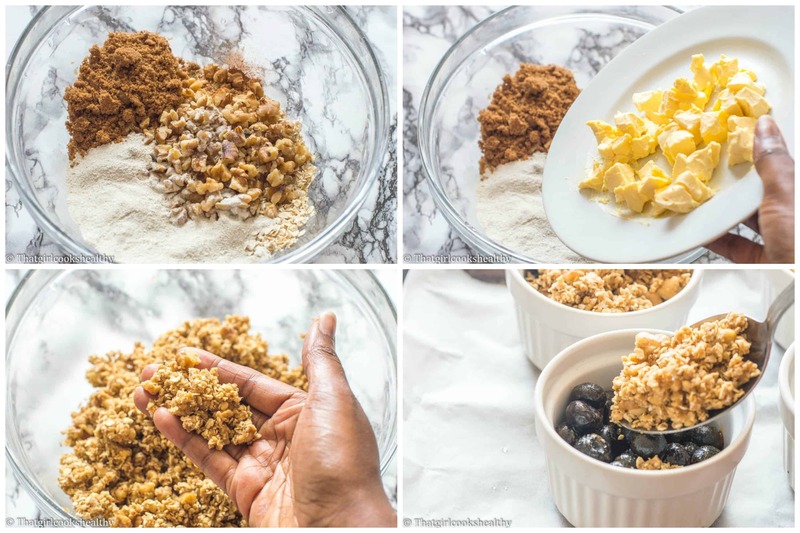 I can’t wait to try this blueberry crisp recipe in them. I also love that I don’t have to grease the ramkins. Perfect recipe indeed! Thank you for another great recipe. I can see myself making this a regular for my family. Wow! 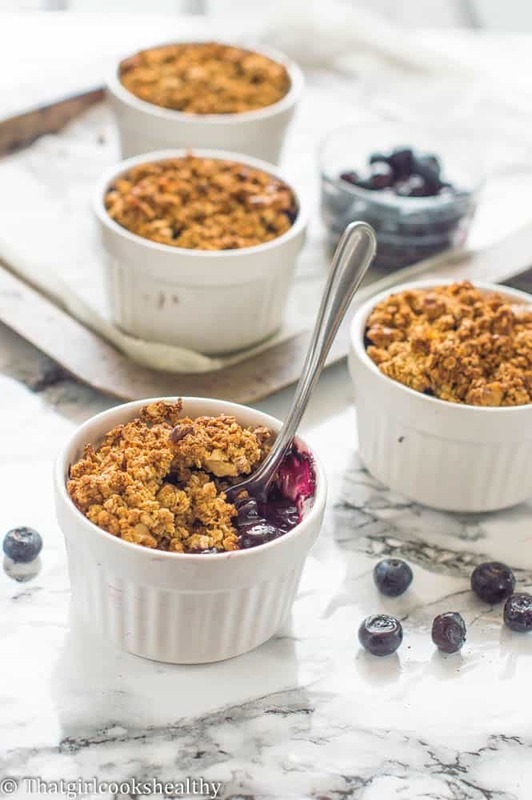 This Blueberry Crisp recipe looks beyond good! And I love that it’s gluten-free! Pinned for later! Thanks for the love Shanika!! The blueberry filling looks perfect. This is a must try! I’m a big texture person and that crunchy topping looks like a great compliment to those blueberries. Thanks! Yes, it sure does!! This is lovely! I don’t bake much, but I know my grand daughter would love to make it with me, and enjoy it afterwards!